Tim Hortons’ banana pecan muffins is our family favorite and I wanted to recreate the same at home. 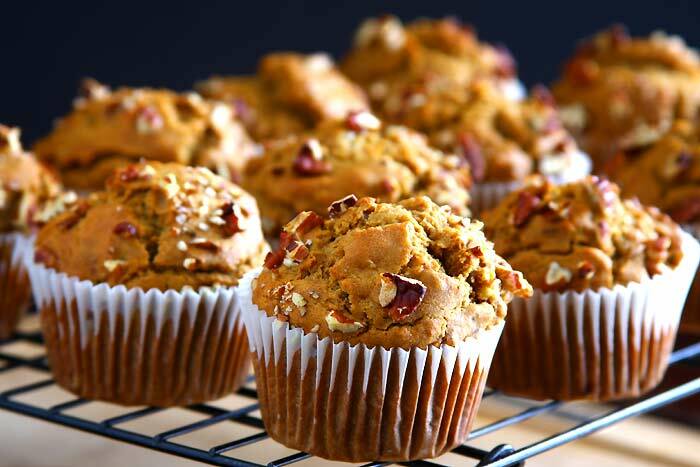 I do have a vegan banana walnut muffin recipe in the blog already but I was looking for a bakery style banana nut (pecan) muffins recipe and found one such recipe here. By bakery style I mostly mean the huge rise and the golden brown color it has. 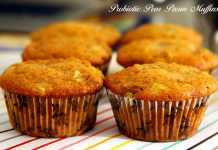 I have never had any problems with my eggless muffin recipes having a good rise. But I have always wanted to bake muffins with the tall rise like those we find in bakeries. So when I found a recipe which said “bakery style” banana nut muffins I was excited! The trick the author mentions is to bake the muffins at a higher temperature first and then finish the baking at a reduced temperature for the rest of the time. Apparently this small variation gives the muffins the desired rise and color. 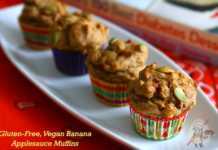 I have followed this trick while baking eggless quick breads but haven’t tried it with muffins. 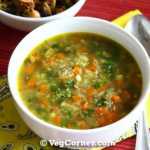 As for the egg replacement, I used apple cider vinegar instead of the 2 eggs mentioned in the original recipe. Initially I wanted to use yogurt as the egg substitute but then decided to bake these bakery style vegan banana pecan muffins and went with the vinegar option. With all the changes and substitution these eggless banana pecan muffins turned out very beautifully; tall, dark and handsome! Want more ideas to bake with bananas? 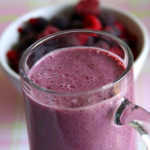 Check out here for other delicious banana recipes. 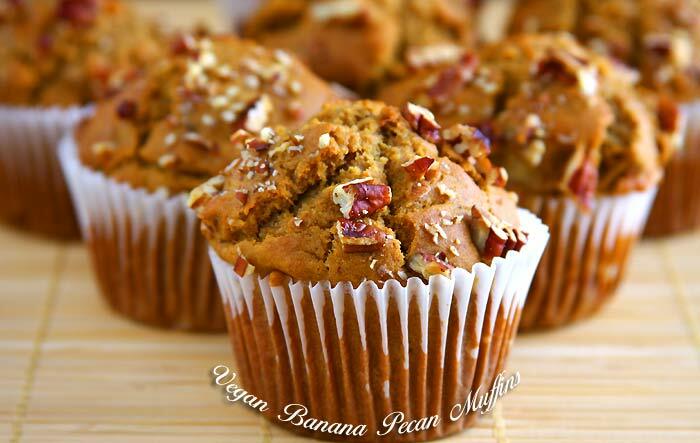 Looking for a bakery style, eggless banana pecan muffins recipe? 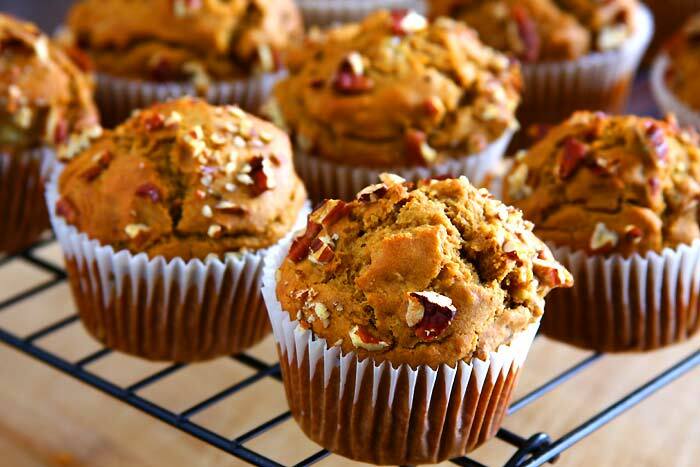 Here’s the “no-fail” recipe to bake tall and beautiful, vegan banana pecan muffins in a jiffy. Preheat oven to 425F and line 12 muffin cups with paper liners. Grease it lightly with non-stick cooking spray. 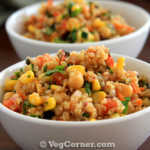 In a large bowl, toss together the Part 1 dry ingredients, make a well and set aside. In a medium bowl, whisk together Part 2 ingredients. Incorporate the wet ingredients into the dry ingredients. Using a rubber spatula or wooden spoon, gently mix everything together and just as the batter starts to come together, fold in ? cup of chopped pecans. At this point I felt that the batter was too thick and added water little by little to get the correct consistency. I added about 1/2 cup of water. Scoop out about 1/3rd cup of batter for each muffin and divide the remaining batter amongst the 12 paper liners and top with the remaining ? cup chopped pecans. Bake at 425F for 5 mins and then reduce the heat to 375F, bake for another 12-15 minutes or until a toothpick inserted into the center comes out clean. Remove the muffin tin from the oven and place it on a cooling rack for at least 5-10 minutes. Then take the muffins out of the pan and let it cool completely on the wire rack before storing the muffins in an air-tight container. Depending on the type of wheat flour you use, you will have to add about 1/4 to 1/2 cup of water to get the correct consistency of the muffin batter. 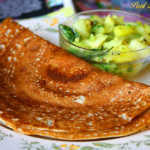 Whole wheat flour usually absorbs more water and that too varies according to the brand you use. 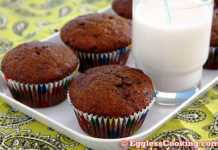 If you prefer sweeter muffins you will have to increase the quantity of sugar by another 1/4 cup. We prefer mildly sweet muffins so this itself was perfect. You’re very welcome Sowmya. That was very quick.